Feel fabulous when you wear Betty Boop by Melfleurs. Introduced in 2011 for women, this fragrance collection orchestrates floral and fruity notes of persimmon, pomegranate, dark plum, lotus flower and black orchid. Like its namesake character, this warm and spicy scent is both endearing and enduring. Enjoy being feminine and having fun at any age with this unique blend of invigorating aromas. Add this fragrance to your personal collection and get ready to kick up your heels. I got this because my mom loves Betty & I was giving it to her just because...unfortunately for me, when it came it smelled SOOOOOOOOO GOOOOOOOOD I didn't want to give it away. I gave it to her anyway, it is mom, (sad face),,,but I will be purchasing an actual bottle of this stuff for myself!!!! I've been collecting Betty Boop items since 1980 (she has her own big room at my house) I was happy to find it at a affordable price. I love my Betty Boop perfume and will share this seller with my friends. It came carefully pack inside its box and I also got 2 free samples. THANKS & BOOP-OOP-A-DOOP!! 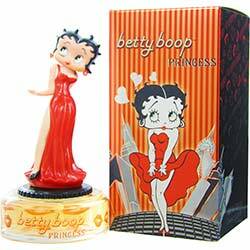 This fragrance is INCREDIBLE and it doesn't hurt that I am a Betty Boop collector either. I was amazed when I actually put the fragrance on and the compliments I received and was proud to wear it as I could smell how good I smelled as well. I highly recommend this fragrance for anyone of any age. It is a very clean, smooth and wonderful fragrance I have been trying to find for a while and now, I am hooked and will forever purchase this fragrance. Thank you for bringing this fragrance out to the public.